Nelson’s passionate love affair with Emma, Lady Hamilton is an essential ingredient of the Nelson legend. What makes it particularly piquant is the apparent acquiescence of Sir William Hamilton. The three were referred to by Emma as the “Tria Juncto in Uno” for, as she said, “Sir W., he and I have but one heart in three bodies”. This was a play on the motto of the Order of the Bath, of which both Nelson and Sir William were members. Nelson first met Emma in 1793. Her husband was the British Ambassador to Naples, a cultivated diplomat with wide ranging interests in art, antiquities and volcanology. He was then 63 and Emma just 32. They had married two years previously and despite every expectation were happy together as, indeed, they were to remain. Emma had had a remarkable career. Born Amy Lyon to a Cheshire blacksmith she had passed from one lover to another until finally her then lover, Charles Greville, had persuaded his uncle Sir William to take her under his wing. Amy had undergone a complete transformation over this period, becoming Emma Hart. She had become one of the age’s most celebrated beauties and a favourite model of the noted portrait painter Romney who called her “the Divine Lady”. In Naples she had developed a close friendship with the queen and become a person of some influence. She gained fame, also, for her “Attitudes”, performances where she posed to represent figures from classical mythology. Sir William even had a large frame made for her to pose in ! Nelson’s first introduction to Emma and Naples was a brief one and it was not until five years later that they were to meet again. He was now, however, a celebrated hero, having inflicted a crushing defeat on the French at the Battle of The Nile. Public reaction to this victory had been euphoric and nowhere more so than Naples where, on hearing the news, Lady Hamilton had fainted, falling dramatically to the floor. On his arrival there, Nelson was overwhelmed by his reception, particularly from Emma. He wrote “up flew her ladyship exclaiming ‘Oh God, is it possible !’ She fell into my arm more dead than alive”. For Emma the appeal of Nelson was irresistible – here was a man with great charm, ability and intelligence, personally courageous, the victor of the greatest battle of the war and bearing the wounds from that and previous encounters, and yet, in person, such a slight almost insignificant figure, clearly in need of a woman’s care, support and adoration. For Nelson the effect was overwhelming. His wife was at home in Norfolk sending him letters full of petty gossip and his stepson, serving with in the Mediterranean, was proving to be an increasingly embarrassing disappointment. He had already had a brief liaison with an Italian opera singer, Adelaide Correglia, and now staying in the heady atmosphere of Naples he was very susceptible. To his commander, Earl St. Vincent, he wrote, “I am writing this opposite Lady Hamilton, therefore you will not be surprised at the glorious jumble of this letter”. St. Vincent was concerned and wrote to Emma, “Pray, do not let your fascinating Neapolitan dames approach too near him for he is made of flesh and blood and cannot resist their temptations”. Nelson found the unaccustomed uncertainty of his situation unsettling. He had already described Naples as “a country of fiddlers and poets, whores and scoundrels”. Nevertheless, through Emma, he was drawn into the seething politics of the kingdom, taking it upon himself to regard the safety of Naples as more important than the orders of a new commander in chief, Lord Keith. His association with Emma soon developed into an affair which scandalised his colleagues and polite society at home. Keith remarked, “he is absurd with Lady Hamilton and vanity. I wish he would go home and her too”. The affair was probably consummated at sea when Emma and Sir William joined Nelson on a cruise to Malta in May 1800. Nelson remembered this in a letter to Emma the following year, “Ah! those were happy times, days of ease and nights of pleasure”. When Sir William was recalled from Naples, Nelson took the opportunity to take leave and join them on what proved to be a four month tour across Europe [during which Nelson met and befriended the composer Haydn in Prague]. Finally, the party arrived at Yarmouth on a packet boat from Germany on 6th. November 1800. Nelson’s reunion with his wife in London was an uneasy one. The situation came to a head early in 1801. Fanny [Frances], exasperated by Nelson’s constant references to Lady Hamilton, had finally exploded, “I am sick of hearing of dear Lady Hamilton and am resolved that you shall give up either her or me”. Nelson’s choice had really already been made for at the end of January 1801, Emma Hamilton had given birth to his daughter, Horatia. She was promptly and discreetly placed with a wet nurse, Mrs. Gibson, but Nelson could not disguise his delight in being a father. He and Emma maintained the fiction that their interest in the child was on behalf of the real parents, a Mr. and Mrs. Thompson, and he wrote to “Mrs. Thompson”, “Its name will be Horatia, daughter of Johem and Morata Etnorb ! If you read the surname backwards and take the letters of the other names, it will make, very extraordinarily, the names of your real and affectionate friends, Lady Hamilton and myself”. To Emma, Nelson wrote,”I never had a dear pledge of love till you gave me one, and you, thank my God, never gave one to any one else”. Clearly, Emma had never told him about little Emma, her daughter by one of her former lovers, whom she had placed with another family. Sir William knew of the child and helped to support her. He never made it clear, however, whether he was aware of Horatia. In September 1801 Nelson bought a new house, Merton Place, in Surrey, chosen and furnished for him by Emma. She and Sir William moved in to be joined by Nelson the following month. There at last he was able to live with Emma (and, of course, Sir William) and entertain those who were prepared to condone such an unusual arrangement. 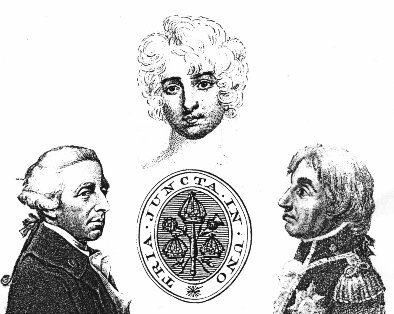 In April 1803 the “Tria” began to break up with the death of Sir William. Now, if ever, perhaps was the time to learn his personal feelings about his wife and Nelson. He died, however, in the arms of Emma and holding Nelson’s hand. In his will he left his favourite portrait of Emma to Nelson who he described as “my dearest friend … the most virtuous, loyal and truly brave character I have ever met … God bless him and shame fall on those who do not say amen”. “The world never lost a more upright and accomplished gentleman”, wrote Nelson. It was now possible to have Horatia with them at home, but Nelson’s opportunities to enjoy family life at “Paradise Merton” were to be few. Shortly before he left for the final time, in September 1805, Nelson exchanged betrothal rings with Emma in a ceremony blessed by a priest. On 21st. October he fell on board the Victory. His last thoughts in his dying moments were of Emma and Horatia. “Remember”, he whispered to his doctor, “that I leave Lady Hamilton and my daughter, Horatia, as a legacy to my Country … never forget Horatia”. The government could not, of course, make any such provision and gradually Emma frittered away all she had been left. In 1808 Merton had finally to be sold. Eventually, her household diminished to just herself and Horatia, and in 1812 she was arrested for debt. When friends secured her release she fled with Horatia to Calais in 1814. She died there in January 1815. Horatia, then 14, was sent back to England to live with the families of Nelson’s sisters. In 1822 she married the curate at Burnham Market, Philip Ward, bore him a family of nine children and died aged 81 in 1881. Lady Nelson, unlike Emma, did receive a government pension. Despite her husband’s desertion of her she remained devoted to his memory until her own death in 1831. To her eldest granddaughter she once divulged her true feelings. “When you are older”, she said, “you may know what it is to have a broken heart”.